THE WRITING BUDDHA - Opinions | Books | Movies: Anything to Look Hot by Jas Kohli (Book Review-3.5*/5) !!! Anything to Look Hot by Jas Kohli (Book Review-3.5*/5) !!! It had been a long time since I read a book published by Srishti Publication, one of the publishing houses which taught me to read books, before I picked up "Anything to look hot" yesterday night. 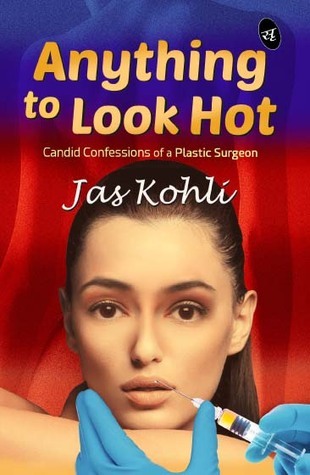 The book is written by the debutante- Jas Kohli who has tagged this book as "Candid Confessions of a Plastic Surgeon". The cover page is interesting and makes you pick it up once to check out what it is really about even in case you are not interesting in buying any book on that particular day. The book is definitely different and reading about the life of someone about whom we haven't read much and very few of us have any acquaintances with any plastic surgeon has been a very fresh air between all the love stories and character-based tales. Jas Kohli have written the book in a simple language and in the same flow without ranging the intensity with the scenes. As a plastic surgeon himself, he knew more than anybody else and therefore, you will feel that you are reading 60% autobiography and 40% fiction. It has been magnificent that author have kept the story based on the clinic life of the doctor itself and still manages to make his reader complete the whole book without getting bored. The characters are also developed beautifully and you can relate with each one of them. I just felt that author didn't describe many scenes which were worth a wonderful read and he have confined many good scenes in just few sentences. Also, I didn't find the conversations interesting. Whenever author tells a story, it's impressive but whenever he shares the conversation between the characters, you find it forced and boring. Initially, it is hard to pick up with the pace of the book as the whole concept is little new for a reader but after 30-40 pages, the story becomes interesting and you want to know the role of medical surgeons in our medical system. Author shares many insights and also becomes philosophical at times to explain the work of these professionals. He also doesn't shy in telling that often plastic surgeons fall for their beautiful patients even after being married and ruin their family life. He also discusses how actors and actresses sometimes throw tantrums while sometimes stay over-friendly as they do not want to reveal that they have been under knives and scissors. Also many myths regarding the surgery has been cleared through the simple story that author have chosen as the medium to clear the air. Coming to the drawbacks- I felt the author could have made this book more happening and humorous as the theme allowed it easily but author chose to keep it too serious. As I have mentioned above, the conversations are powerless and few good scenes at which reader feels that he is about to read a sensational stuff, it gets over within a paragraph itself. Author could have easily turned this book into a thriller. It had the capacity. And I felt it little underwhelming as Nandini, wife of protagonist, is almost sidelined after the marriage as she has been one of the interesting characters of this book, you wish to read more about her. Even the daughter isn't discussed much. That's all. I give this book 3.5 (3 for the book and 0.5 for the new concept) stars out of 5 and it's definitely readable. Go For It! It's something new.